Home > Naperville,_IL,_USA > Vendors > Limos_Without_Limits,_Ltd. Limos Without Limits, Ltd. Naperville, IL. We are a full service limousine company offering a fleet of 23 vehicles ranging from sedans all the way up to 26 passenger limos! Our company conducts over 650 weddings per year and was voted # 1 limousine company in 2007 by Splendid Brides magazine and recently won the 2009 Brides Choice Awards. Limos Without Limits, Ltd. conducts complete criminal background checks along with initial drug testing at the time of hiring and random tests monthly on all of its employees and drivers. We also conduct complete driving history checks on all our drivers every 3 months. Our airport division is second to none. We always monitor your flight and are aware if you will be early, late or on time. This ensures that we are always there on time waiting for you. All our rides are private. We do not do shared rides. We cater to the client that seeks the true "limousine" experience. Our corporate client list includes some of Illinois' largest corporations. We look forward to serving you and adding your name to the long list of satisfied clients we service on a regular basis. Our exquisite fleet includes sedans and also vintage vehicles, SUVs, limobuses and limos up to 26 passengers. We offer the VERY best in vehicles. Our limousines are insured for the maximum liability amount and are meticulously maintained. Limos Without Limits employs fully qualified chauffeurs who are properly trained and attired and they will do everything to make sure you have a comfortable and a safe trip. If you seek 5-star limousine service at a fair price, Limos Without Limits is your answer! Please call us with any questions. We book up very quickly so call today. professional company & very accommodating to needs! 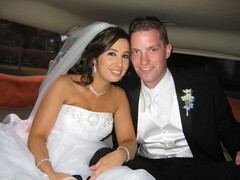 we had the experience of a lifetime in their exclusive Cadillac Escalade Limo. it had Lambo doors and imported Italian suede, a fireplace and personalized scroll! the president of the company was our driver, he was very prompt & helpful during our transportation needs!